Apache Hadoop is a framework that allows for the distributed processing of large data sets across clusters of computers using simple programming models. It enables organizations to more efficiently and cost-effectively store, process, manage and analyze the growing volumes of data being created and collected every day. Hadoop is deployed at enterprise organizations around the globe, including Amazon Web Services, AOL, Apple, eBay, Facebook, Netflix and Hewlett-Packard. The latest version of the platform, released Wednesday, has been more than four years in the making and has a number of new components. 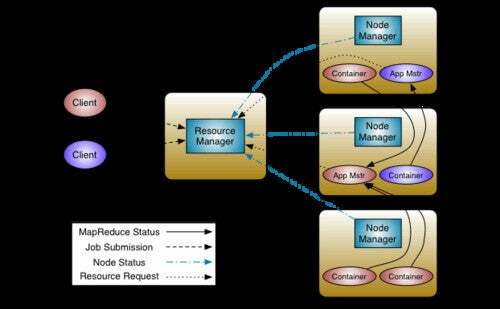 Most notable is the addition of YARN, (Yet Another Resource Negotiator), which is a successor to Hadoop’s MapReduce. The new version splits major functions into two separate daemons, with resource management in one, and job scheduling and monitoring in the other. YARN sits on top of the HDFS (Hadoop Distributed File System) and serves as a large-scale, distributed operating system for big data applications, enabling multiple applications to run simultaneously for more efficient support of data throughout its entire lifecycle, Apache said in a news release. Hadoop 2 and YARN gives users the ability to mix batch, interactive and real-time workloads within a stable foundational part of the Hadoop ecosystem, it said. Apache also refers to YARN as MapReduce Version 2. It retains API compatibility with the previous version, and applications written for MapReduce will run on YARN if recompiled, the foundation said. More than a dozen Apache projects integrate with Hadoop, and ten more are about to follow, Apache said. The General Availability (GA) release of Hadoop 2 follows a preview distribution that was released in June, that also included YARN. Apache Hadoop 2 will be released under the Apache License v2.0.